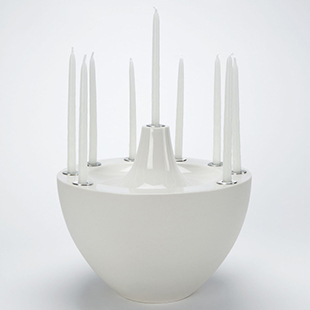 Thanks to generous funding from the Mandel Foundation, Heights Arts has commissioned a custom trio of mezuzot designed and fabricated by Cleveland metalsmiths Pamela Argentieri and Matthew Hollern, plus a design-forward porcelain menorah by Seth Nagelberg, head of the Cleveland Institute of Art Ceramics Department. 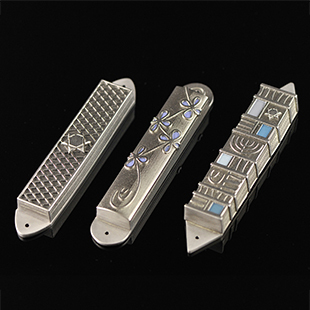 A limited edition quantity of each will be available during the 16th Annual Holiday Store, with custom orders in silver possible for the mezuzot (lead time to be determined by the artists). With these 2017 special commissions, we have formed new partnerships with both the Mandel Jewish Community Center and the National Council of Jewish Women/Cleveland. Members of those organizations will also receive our 10% Heights Arts membership discount on the purchase of any of these four select items.